I understand her gripes, but the truth is it’s not just hair, at least not for many women. I started wearing my hair in its naturally curly state over 10 years ago, long before it had become the hip thing to do and at a time when there were no natural hair blogs or YouTube videos to guide me. I wasn’t trying to be part of a movement, either. But once I started to embrace my thick, curly mane, I started to embrace my quirky, offbeat personality too. This is a movement because it's a stepping stone toward the goal of creating a new standard of beauty. I've been told by people, people of my own race, that not only is my hair is too curly but my nose is too wide and my skin is too dark. 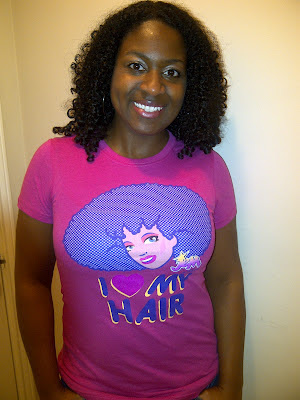 Natural hair, however, is giving so many women, the confidence to define beauty for themselves. Now to be clear I'm not implying that black women who chemically straighten their hair are doing so because they're suffering from self-hatred. That's ridiculous. But for me natural hair was a gateway to self-acceptance and I know many, many women who can tell a similar story, stories I've been privileged to share in articles for publications such as Weld for Birmingham. Furthermore, natural hair can be the common ground needed to bring women together. I can’t keep count of the number of times that while at a mall, a restaurant, or a grocery store I’ve been approached by a complete stranger who wanted to ask me about the hair products I use. I’ve met women at natural hair meetups hosted by Birmingham Natural Beauties who have become some of my best friends. In spite of all this, however, I will admit that sometimes I wish it was just hair. Then maybe we wouldn’t have had so many people more focused on Gabby Douglas’ ponytail than her performance at the 2012 London Olympics when she made history and became the first African American to win the all-around gymnastics gold medal. And if it was just hair perhaps U.S. Surgeon General Dr. Regina M. Benjamin wouldn't have needed to issue a public plea last year asking black women to stop forgoing exercise for fear of a bad hair day. And there’s the rub. How can we celebrate our tresses without allowing our hair to dictate our lives? This question seemed to be at the heart of a recent Birmingham Natural Beauties meetup held last Tuesday that focused on health and fitness. A few ladies gave tips on how naturalistas could manage their hair and still remain active. Also, Dr. Mia Cowan of MiBella Wellness Center gave diet and exercise tips, speaking on the importance of eating breakfast, getting enough protein in your diet, and adding strength training to your workout regimen. While we were all brought together that evening because of hair the message was clear: do not live your life constantly worrying about the cuteness of your coif. How you feel on the inside is much more important than how you look on the outside. I wish it was "just hair" as well. When I decided to go natural, it wasn't to be apart of a movement either. I knew of natural hair but I never had a desire to cut all my hair off and be prideful that I did so. I decided to go natural because I became a but more financially conscious and because I had "long hair", it was at least $65-70 to get it relaxed and styled. I also became natural because on that day, my hair stylist didn't feel like doing a "perm." LOL. People can't tell I'm natural. In fact, when I get my hair straightened, most people think it's weave because my hair is wavy/curly one week, and bone straight the next. To be honest, it's kind of annoying with the amount of questions in regards to if my hair is real, what I color is my hair, and what I'm mixed with. I hate that I can be a regular black woman with goldish/blonde long hair, because that's exactly what I am. I hear you, Carla. While I like answering questions about products I am annoyed by questions like "How did you get your hair to grow?" or "How did you get your hair to curl like that?" When I say that this is my natural curl pattern and that I've always had long hair I then get questions about my ethnicity. And people get really confused because I'm dark-skinned and apparently my hair texture only belongs on the heads of lighter-skinned women. In fact I had a very fair skinned black woman asked me last week, "How are you that dark with hair like that I'm nearly white with nappy hair?" Sigh. Great post! I love being natural and love the way it's connecting us as Black women in ways we haven't seen before. It gives a sense of community that I think we've been wanting, craving, and needing for a long time! It's great to see another sista out and about and compliment her on her twist out, and then talk about hair and products like we're immediate besties. I give compliments regardless, but this experience is extra special!